Coquitlam SAR members were kept very busy last weekend in a combination of training, search and one international competition. 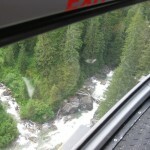 On Saturday, several members trained at Gold Creek in Golden Ears park for Swift Water rescue. Two members were certifying as First Responders (first aid). 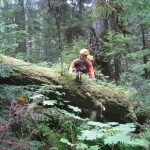 On Sunday, members of our Mountain Rescue group were training on Burke Mountain. 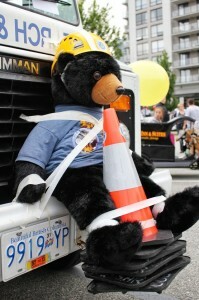 The team attended the annual Coquitlam Teddy Bear Picnic and Parade event. 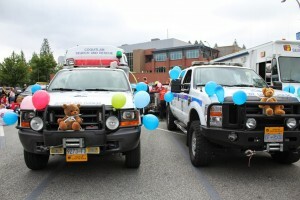 Every year we enter our SAR vehicles in the community parade, and participate in the picnic. One Coquitlam SAR member competed on a team representing Canada in the Grimp Day international rope rescue competition Namur, Belgium where he placed 20th out of 34. 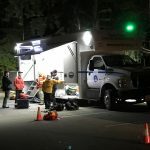 Finally, on Saturday evening the team responded to a call from Port Moody Police for two missing women in the Belcarra Park area. They had been hiking, and reported themselves lost. SAR members responded, using local knowledge to access them on unmapped trails and brought them to the trail head by 11:30 PM.